Recorded 3 times at fast speed on side 1 (with a partial 4th recording), side B is empty. Each recording is strictly the same program each time (checked byte for byte). The inaly and tape look hand-made. 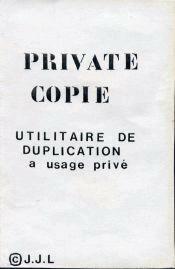 They state "Private Copie" but the program itself states "Private Copy V2". Thanks to Sylvain Laurent for the tape. This is an extremely useful program that has been invaluable to me over the last couple of years.